Thunder rumbles off the bayou and wind-whipped palm fronds rattle outside Evan Christopher’s Mid-City home. It’s a gray afternoon in June and through the sounds of a brewing storm, the bright wail of a clarinet glissando pours out of Christopher’s shotgun double, gliding between thunder cracks like an organic melody for the rhythm of New Orleans’ weather. It’s actually a phrase Christopher created for his Django à la Créole project, a hybrid of music drawn from Django Reinhardt’s catalogue, the New Orleans clarinet tradition, and the rhythms of the Caribbean, Latin America and beyond—a cultural sphere known as le monde Creole. Still, the soaring clarinet line sounds at home amid New Orleans’ moody summer elements, as if Christopher’s playing has been part of the city’s soundscape all along. And in a way, it has. A meticulous researcher and self-professed music nerd, Christopher’s clarinet voice represents components he identified from throughout the instrument’s broad history in New Orleans. Having carefully catalogued those individual details into a kind of New Orleans clarinet vocabulary, he then incorporated them into his own style, allowing him to create a unique sound that looks to the future from the vantage point of the past. He has a deep understanding of how and why certain stylistic traits evolved in the work of the city’s most influential early clarinetists. Christopher doesn’t just incorporate the “Latin tinge” Jelly Roll Morton spoke of; he’s fluent in the music of the cultures from which that tinge emerged. His rare, multi-dimensional comprehension of the music’s history—along with his all-star chops and rich, lyrical tone—allow him to position the New Orleans clarinet as its own musical language. It’s a complex approach but it gives him the flexibility to riff on the early jazz tradition one minute and improvise a soul-drenched blues the next without compromising the personality of his own voice. 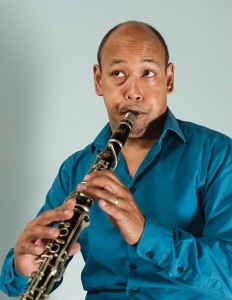 In a SummerFest seminar on August 3, he explores the musical relationships between Pops and his key clarinet-playing sidemen: Johnny Dodds, Sidney Bechet, Barney Bigard and Edmond Hall. 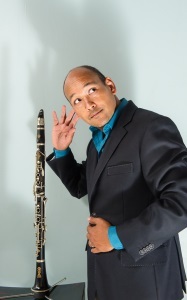 Finally, a few days before the festival, Christopher and Gregory Agid are slated to present a clarinet summit at the International Clarinet Association (ICAC) Conference in Baton Rouge, where they’ll trace the instrument’s New Orleans history from Bechet through Alvin Batiste. “It’s a whole weekend of finding opportunities to frame New Orleans clarinet as a really distinct thing,” Christopher says. That hasn’t been as easy as it may sound. A clarinet that’s not seen in a classical context is usually perceived to be playing jazz. But the term “jazz” troubles lots of musicians—including Christopher, who shies away from the word in reference to his original music. For one thing, the term has come to represent a less melody-centric form than what he tends to play. Talking to Christopher, you also get the sense he doesn’t want to be boxed in. As a bandleader in Django à la Créole and the various lineups comprised under the Clarinet Road moniker, Christopher’s clarinet is generally the only horn. At Satchmo SummerFest, he’ll explore the relationship between clarinet and trumpet in traditional New Orleans jazz. “The thing that I love most about the groups with Louis was that interplay,” Christopher says. “Even more than the clarinet as a solo instrument, I think I enjoyed the collective improvisation. A longtime lover of traditional New Orleans music, Christopher first moved to the Crescent City from California in 1994 after performing here on a tour with A.J. Croce. He had been working with a wide variety of groups, from West Coast straight-ahead jazz to skiffle to what he describes as “a band fronted by a guy who wanted to croon like Bing Crosby.” This juggling helped him to learn to adapt quickly and think on his feet. But it wasn’t as exciting as finding an entire community of players his age who were interested in people like Bechet and Dodds. He packed up and moved a few months later. A gig in Texas lured him away for three years, but he returned, determined to delve further into the history of the city’s early clarinetists. The relocation process ended up teaching him much more. “Everybody knows of Louis Armstrong, but it wasn’t really until I got here that I pieced together just how significant this milieu was to those musicians and that music,” he says. Torkanowsky adds that today, “Evan can play the entire history of the Creole clarinet” without it necessarily sounding stuck in time. While gigging around town and recording a series of albums under the Clarinet Road banner in the early 2000s, Christopher began working toward a master’s degree in musicology at Tulane. 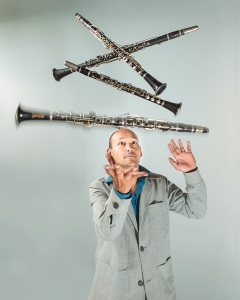 Though he gave up the program after his home flooded during Katrina, what he’d focused on in school became a focal point for his career: identifying the elements that make up what he calls “the Creole paradigm” for the clarinet. After the storm, he took that consistency and a desire to build new audiences to France for an artist residency supported by the French-American Cultural Exchange. There, he created two new groups, the Jazz Traditions PROJECT and Django à la Créole. Seven years and three albums later, on a blustery day in late June, it’s a Django-ized clarinet phrase that sails out of Christopher’s house, mixing with the weather. Inside, Christopher is seated between a baby grand piano, a dining room laden with music charts, the guitarist Daniele Spadavecchio and Don Vappie, who’s traded his banjo for guitar to rehearse for the Django à la Créole: Live U.S. album-release celebration at the Little Gem Saloon. The usual touring version of the band is made up of France-based players, so there’s some extra work to be done to prepare for what Christopher knows will be a new sound brought by Vappie, Spadavecchio and bassist James Singleton. Finally, Christopher moves to the piano and plays a few chords from “Ol’ Man River” to give the other musicians another reference point. He switches back to clarinet as the guitarists find their footing and a breathy, plaintive clarinet line pulls out in front, then falls in step with Spadevecchio’s decisive, steady strums to give Vappie some space to stretch out. “He’s really a musician—intonation, dynamics, tempos, expressiveness, voicings that we use,” Vappie later says. He also finds that Christopher pushes his peers to go deeper into the music. A few days after the rehearsal, it’s show time downstairs at the Little Gem, which is packed—standing room only. Wearing a slight but unmistakable grin, Christopher tells the story that inspired Django à la Créole. In Paris in 1939, Reinhardt met Duke Ellington’s band when they were touring Europe. New Orleans clarinetist Barney Bigard was in the group. Django—a big Louis Armstrong fan—ended up in a studio session with a few of Duke’s players including Bigard, a frequent Armstrong sideman. “They recorded five songs that combined Barney Bigard’s fluid clarinet with Django’s very angular rhythmic style,” Christopher tells the crowd, citing the origin of the Creole–meets–Gypsy-swing concept. He adds, “we took it a step further” by tossing in Cuban and Brazilian rhythms—a nod to the larger Creole world. After the verbal intro, they get back to the music. Singleton opens a blues number with an unusually languid bass solo—a departure from the percussive way he’s handled his upright bass in previous songs. The guitars come in, adding another layer of rhythm. Finally, Christopher picks up where Singleton left off, developing similar motifs before passing the lead back to Singleton for another solo. On Bechet’s “Blues in the Air,” Christopher delivers an emotion-packed solo hinging on the tune’s narrative and launches the whole piece into new territory. Vappie later marvels at Christopher’s flexibility. 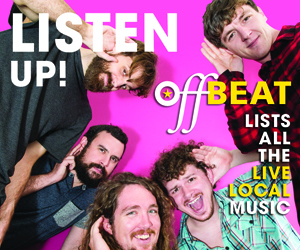 “He’s expanded beyond the typical repertoire and moved into whatever song he hears in that style,” he says.